Yay for fall and squash and colorful leaves and hot cocoa (so underrated since the pumpkin spice latte burst onto the hot beverage scene). This is my favorite time of year and I know that rings true for many of you reading this. 1. It is versatile. Put it in a soup, risotto, bread…grill it, roast it, caramelize it….do what you feel! Bon Appetit features 18 different ways to make butternut squash. Love! 2. It can be savory or sweet. Want a nice bowl of butternut squash ravioli? Sure! How about some butternut squash waffles, topped with a cinnamon whipped cream? Absolutely! 3. It is typically inexpensive and quite accessible. 4. Oh and it provides some good nutrients: vitamin A, vitamin C, vitamin B6 and fiber just to name a few! Whole Living gives a nice summary on the benefits and uses of b.squash. 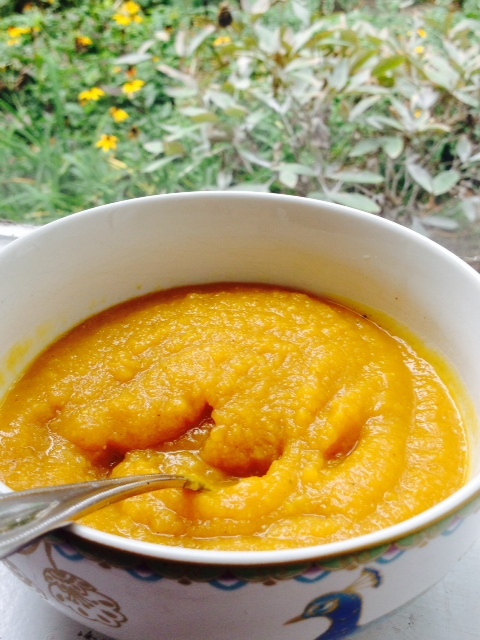 I like butternut squash soup, but as a person who typically follows a plant-based food regimen, I need my soups to pack a punch, both in flavor and in nutrients. So I took a great recipe from CHOW and tweaked it to my liking (added some curry and lentils, substituted the heavy cream and butter) to make a soup that is by far my best, to date! 1. Preheat oven to 425°F (I used the convect roast setting). 2. Prep the squash by washing and then peeling it. Cut it in half and then cut each half in half (lengthwise). Place on a baking sheet and then place in oven for 30 minutes or until the squash is slightly browned and very soft. 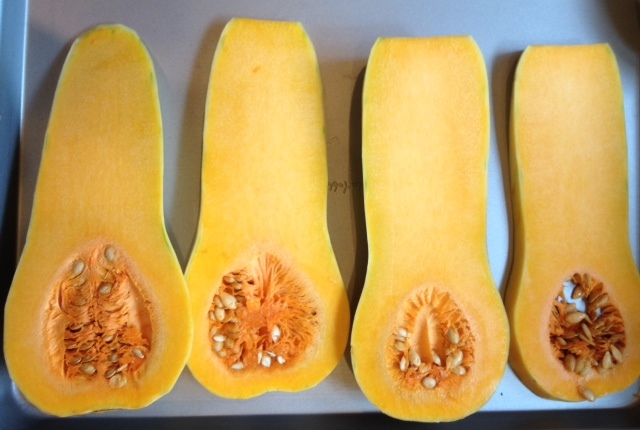 Once squash is cooked scrape out seeds. 3. Pour lentils and water into a 3-quart pot (medium-size). Place pot on a burner at medium-high heat and bring water to a rapid simmer. Once the water reaches a rapid simmer, reduce heat to maintain a gentle simmer (note: you will see a few bubbles and some slight lentil movement). Stir every few minutes and cook lentils uncovered for 25-30 minutes or until the lentils are tender. Once the lentils are cooked, set aside. 4. While the squash and lentils cook, peel and core the apple and then dice into 1-2 inch pieces. Dice the onion in the same fashion. Add the olive oil, onion, apple, salt and pepper to a pan and saute on low heat for 15 minutes or until the apple and onion are soft. Set aside when cooked. 5. Once the squash is ready and cooled enough to be able to cut, roughly cube the squash and place in a pot with all of the remaining ingredients: sauteed apples and onions, lentils, water and curry powder. Do not add the almond milk at this point. Bring the pot to a low boil, cover and let sit for 10-15 minutes. 6. Now allow the contents of the pot to cool enough to then transfer (half a batch at a time) to a blender or food processor to purée. Before blending the soup, add the almond milk and then purée the soup until smooth.